Comparison between the shortened UK VHS released by Futuristic Entertainment (BBFC 18) and the uncut German VHS released by Screen Power. There are 2 minutes and 15,75 seconds missing in 5 scenes. Anchor Bay released a box set in the USA as well as in the UK that includes the first 3 movies and the uncut version of part 2. You don't see Angela reaching for Phoebe's tongue. She puts the knife on the tongue and says that this is what awaits malicious tongues who want to tell dirty stories. Then she cuts the tongue off while saying that this happens to anyone who doesn't comply with the camp's rules. She puts the severed tongue on Phoebe's shoulder and then leaves the screen. The title is different for both versions. 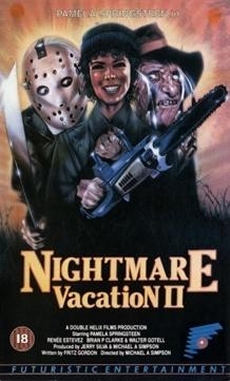 UK Version: Nightmare Vacation II. The knife is pulled out of Ally's back. The next stab was cut out. Ally's death was cut out. Angela grabs Ally, throws her against the toilet's door and then jails her inside the toilet. Then, Angela gets a stick and goes to Ally inside the toilet. Now, she grabs Ally and - after a short dialogue - completely dips her inside the catch tank. When Ally repeatedly tries to come back up, Angela pushes her back down with her stick. When Ally drowns inside the faeces, Angela goes back out of the toilet. Angela turns the knife around in Diane's stomach (close-up shot).